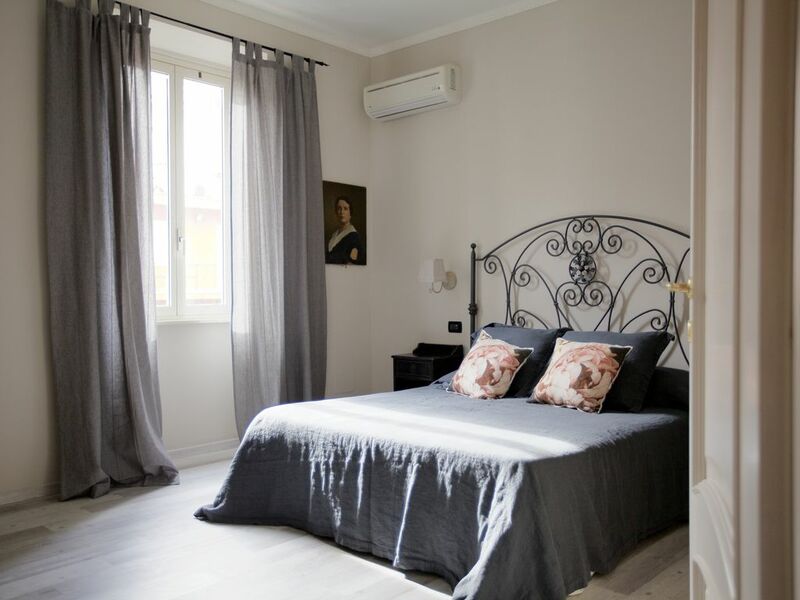 Holidays house centrally nestled: Trastevere is a 15 minute walk, Rome’s historic center is reached in 15 minutes by tram or bus, the Vatican in just a few minutes with the metro train. We are on a very prestigious house in the center Rome (Trastevere) and within walking distance to all the sites and restaurants. The holiday home, on the second floor of the villa, it's equipped with two large, bright bedrooms, a fully-equipped eat-in kitchen and a large full bathroom. From the kitchen you reach the terrace where you can enjoy meals and relaxing moments after your walks through the winding streets of Rome. The house has all the comforts of home including internet Wi-Fi, air conditioning and TVs in every room, bathroom and bedroom linens and towels, heating, a full kitchen and a hairdryer. The view from every window and from the terrace faces gardens and the rooftops of villas. Everything is immersed in peace and quiet in a retro-chic ambience. Villino Rinaldi, built in beginning of the twentieth century on Gianicolo hill. It benefits from an optimal location near Trastevere area and Vatican city. Guest house is perfect for 5 people; the dedicated apartment is situated at the 2nd floor and it includes two bedrooms, a spacious kitchen and bathroom. In the kitchen there is an access to a small balcony where it is possible to consume meals enjoying the Rome’s climate throughout year. In the guest house cats are allowed and they can stay together with their human friends! Quiet area, very clean and comfortable apartment, easy transportation, outstanding local restaurants, very accommodating host. Thank you Cecilia! Accueil très chaleureux de Cécilia. Si on revient à Rome, expérience à répéter. Our family of four enjoyed our stay at this apartment very much. The location was very nice for getting around Rome by bus and taxi. We especially appreciated Cecilia providing extra help in helping us navigate our 3 day visit. If we could give 6 stars we would. Everything was great and Cecilia and Alessandro were great hosts. Great hosts and very cute apartment in great neighborhood! We had a great time! The apt. was everything we had hoped for. Great neighborhood, close to transportation, and clean. We loved our stay in Roma. The apartment was perfect and Cecilia and Alessandro were wonderful and helpful! When we return to Roma, we plan on staying with them again! This was a wonderful place. Very clean & well kept. Lots of information on how to get around the city from your location. Would recommend this to anyone coming to Rome. (Text automatically translated) From Fiumicino airport: train to Trastevere Station (about 20 minutes), then tram 8 (for 1 stop) From Termini station: bus 75 (about 35 minutes). (Text automatically translated) Cottage Rinaldi is located in a very chic, Monteverde old, built in the early twentieth century Art Nouveau, adjacent to Trastevere, then in the center. Due to our location in a few minutes you arrive at the basilica of St. Peter with the underground train, by tram 8 in 15 minutes you reach the historic center (Largo di Torre Argentina, Pantheon, Piazza Navona ...) and with the bus 75 in 20 minutes you arrive at the Colosseum! The map of the area that we provide will help you move as if you were at home, choosing from the best restaurants and pizzerias within a few minutes walk or immerse in the colorful and typical "movida" in Trastevere. If you want a tour guide AUTHORIZED by the City of Rome will take you to learn more deeply the beauty of the capital. Tariffe scontate in relazione alla durata, Tariffe in funzione del numero di persone, Caparra richiesta alla prenotazione, Consegna delle chiavi da parte dei proprietari che vivono nello stesso immobile.